Set the Sous Vide Professional™ to the desired temperature, with rear pump flow switch closed and front flow switch set to full open. For diver scallops, 125°F / 52°C is found to be the best temperature. Season scallops with salt and pepper. In a small vacuum bag, place seasoned scallops along with thyme, lemon zest and chopped shallot. Seal scallops to desired vacuum. For delicate items like shellfish, the best vacuum percentage is 80-90%. This will ensure the scallop is not compressed under vacuum, compromising the integrity of the delicate muscle fibers. Once target temperature is reached, place scallops in circulating water bath. Cook scallops to desired doneness for 12-20 minutes. Gently remove scallops from vacuum bag. Dry the scallops with paper towel. Season scallops with salt and pepper. Sear in a very hot pan with grape seed oil until golden crust forms on both ends. 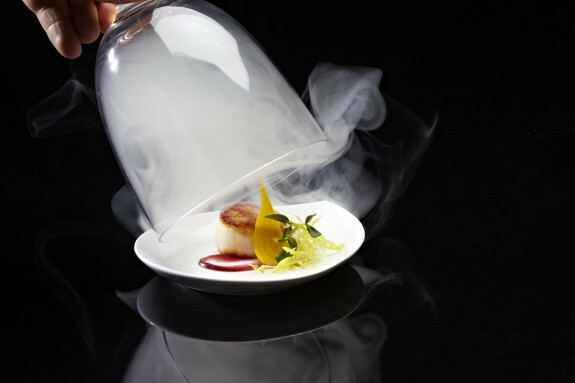 For a touch of smoke, lightly smoke the finished scallop with applewood smoke, using The Smoking Gun™ by PolyScience.